Save 10% off selected departures. Contact us for more details! 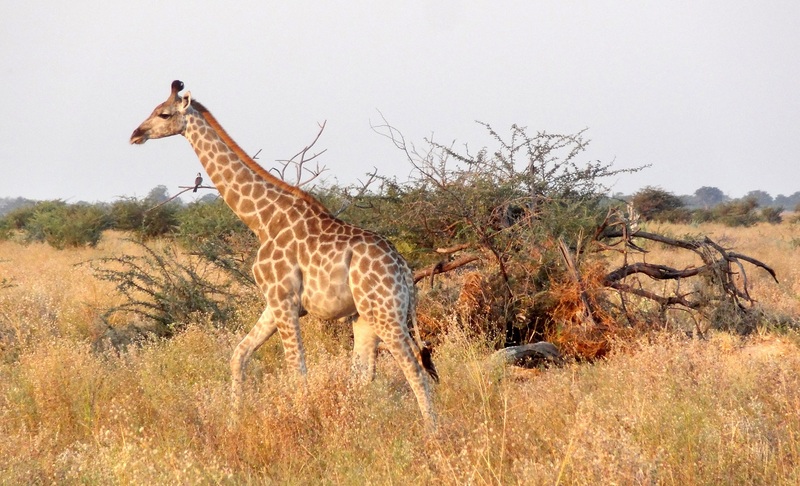 See Africa at its best on this small group safari tour. Experience the spiritual Matobo National Park, the mighty Victoria Falls in Zimbabwe, huge elephant herds at Chobe National Park and Mokoro safaris though the Okavango Delta. Marvel at sunsets over the Kalahari Desert and encounter rhinos at Khama Rhino before heading back to the city of Pretoria. We depart by shuttle via the bustling city and on to the beautiful scenic bushveld of the Limpopo Province. Previously known as the Northern Province, this is a land of myths and legends and is also highly rated as a southern Africa Eco-tourism destination. Arriving in Polokwane, we head to our lodge to meet up with our guide and the rest of the group before we head off to learn more about the local Bakone culture. This interesting open-air museum allows us to learn about traditional methods of the Bakone tribe who were settled in this area from historic times to the present day. Learn how they made fire, harvested and prepared the staple mielie meal, and about the interesting decorations that adorn their dwellings. We later make our way to our accommodations nearby. Note: We join passengers coming from Kruger National park on arrival to Polokwane. 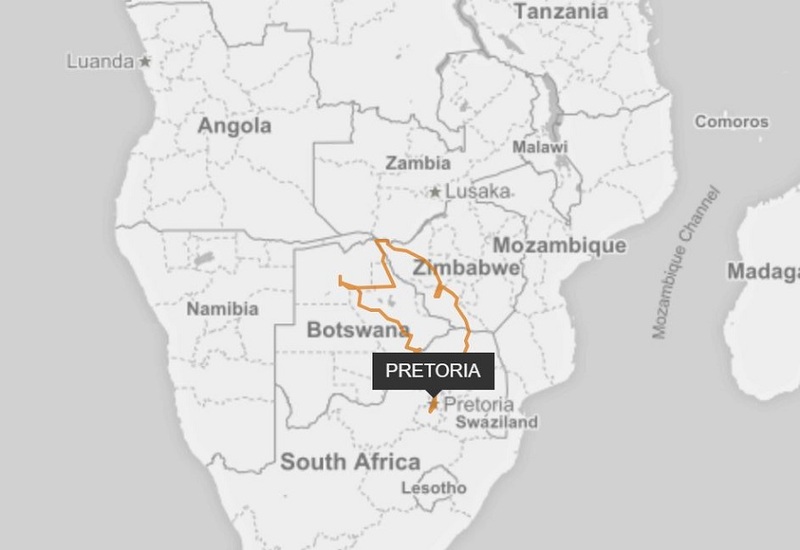 This morning we make our way north crossing out of South Africa and into Zimbabwe. Immigration formalities at the busy Beitbridge border may be lengthy, as this is South Africa’s busiest land border, but once completed we continue to Bulawayo, a pleasant city with broad tree lined avenues and wide open spaces. The area around the city offers much in the way of historical, geological and natural interest. 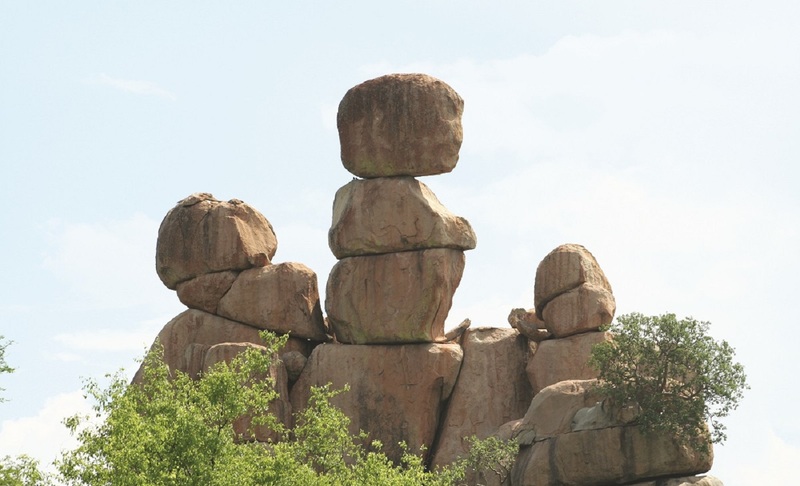 Several national parks are nearby including the well known Matobo (sometimes written Matopos) which we shall visit. Our accommodation for the evening is in a quiet garden setting on the outskirts of town. Rise early today to meet your guides for your visit and game drive into Matobo. 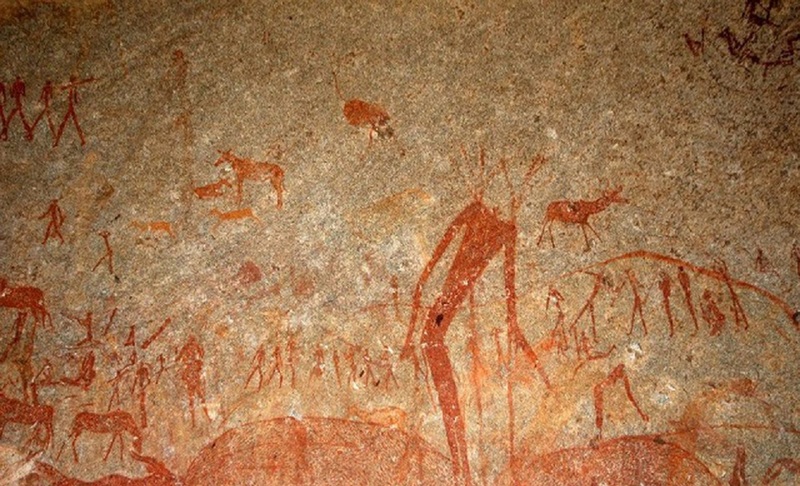 Situated a short distance outside of Bulawayo, the wind-sculptured Matobo Hills are the site of numerous Bushman paintings and the area holds a special cultural and spiritual significance to the indigenous people here. 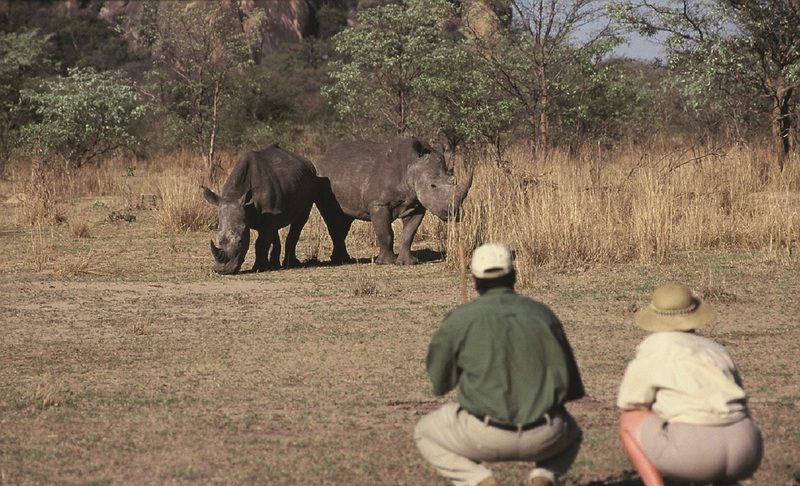 The reserve has the largest concentration of Black and White Rhino in Africa and if conditions are suitable, guides will lead you on foot to some of the more concealed places for a close view of these magnificent animals. The park also has dense populations of the elusive leopard and black eagle and we shall hope to glimpse either (or both) at some point during the day. The Matobo hills are also the location of the grave of Cecil John Rhodes, the 19th century colonialist. The grave is not visited as part of the half day park visit but can be seen on the full day upgrade (arranged locally). Optional Activities: Upgrade to full day tour including historical tour and village tour. Departing Bulawayo, we continue north to Victoria Falls. We usually arrive to Victoria Falls by early afternoon. This is a relatively small town built along the southern banks of the Zambezi River and is Zimbabwe’s primary tourist centre. 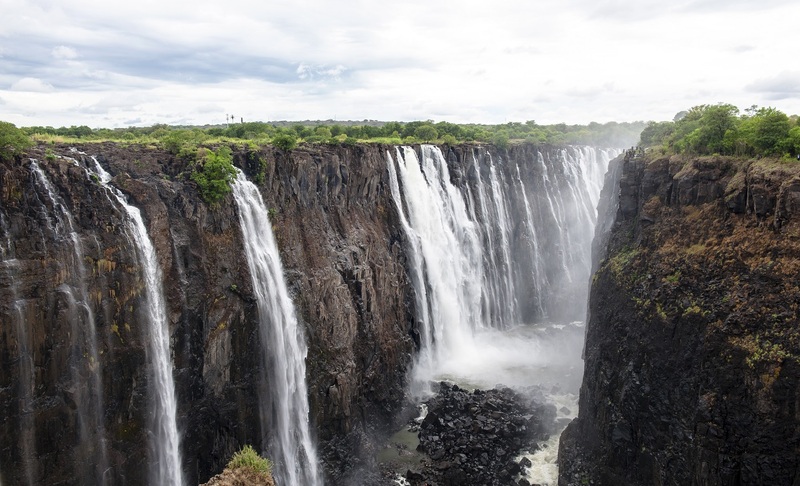 The Victoria Falls themselves are only a short walk and the town has a variety of markets, shops, cafes within easy distance. Your tour leader will arrange a briefing to explain the numerous optional excursions typically available here and you will have some free time to wander around. 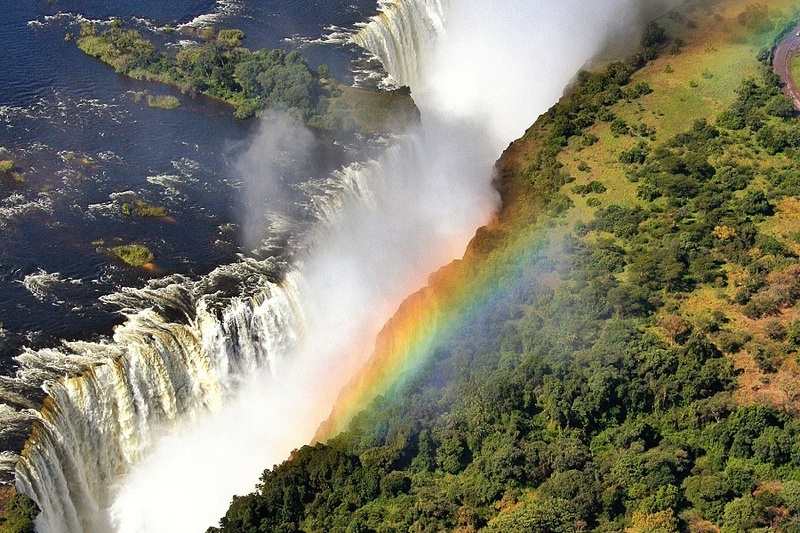 Later we visit the Victoria Falls National Park itself to witness one of Africa’s most enduring sights (NB: depending on time available, we may do this the following morning). Please take care when wandering along the pathways inside the reserve - the Falls are almost 100 metres deep and the drops are sheer! 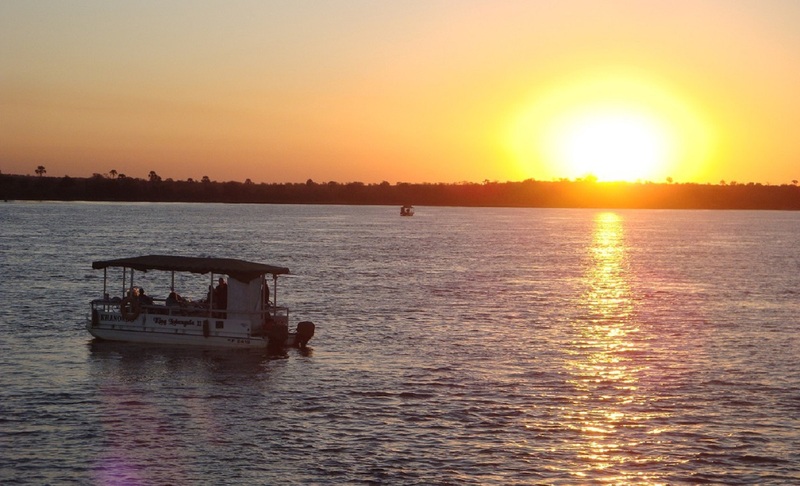 We end our day joining a peaceful sunset dinner cruise on the Zambezi River. Soak up the African ambience with drink in hand as you cruise slowly up and down and look out for elephant, buffalo, buck, hippo and birdlife along the shallow muddy banks of one of Africa’s great rivers. Eventually we return to our accommodation for overnight or to try some of the local nightlife. Optional Activities: Bungee jumping, Full day abseil, gorge swing, Zambezi jet boat and cable car Full day canoe, Full day white waterrafting, Helicopter flights From, half dayfishing, Bridge Tour, Bike Tour. 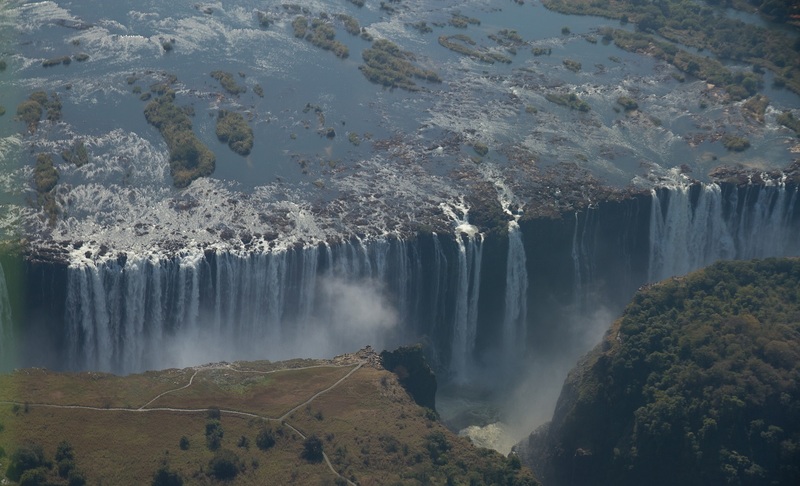 Today is at leisure giving you the opportunity to explore Victoria Falls. The Zambezi boasts one of the world’s highest rated rivers for white river rafting with its many challenging rapids. Alternative options include canoeing,scenic flights, bungi or (more relaxed) afternoon tea at the colonial styled Victoria Falls Hotel. *Please note that some group members may be starting or ending their tour on this day. Optional Activities: See list on day 4. From Victoria Falls, travel the short distance to the Botswana border and cross into the small town of Kasane, and on to your next lodge. This afternoon, head out onto a game drive and boat cruise in the Chobe National Park. Chobe is widely known for its populations of elephant, but the park also contains lion, leopard, hyena, giraffe and a host of antelope and birdlife. 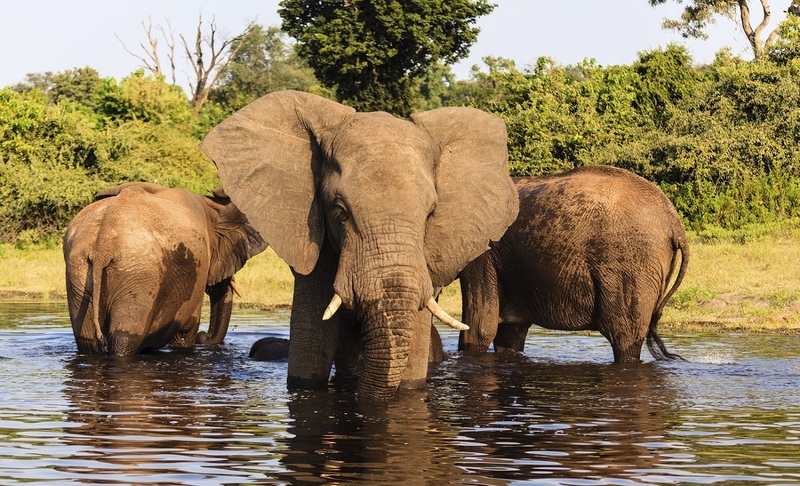 The Chobe floodplains and Chobe River provide a sensitive eco system which attracts much of the wildlife of the region especially in the dry season when it is not uncommon to see between 500 and 2000 elephants on the floodplains at one time. One highlight of Chobe is the combination of wildlife, birdlife and reptiles seen along the banks of the Chobe River. Take the afternoon cruise for a unique perspective of riverside wildlife. Following breakfast, depart for Gweta. Driving south we may be lucky to encounter elephant or buffalo alongside (or on) the road, often strays to the migratory herds which roam freely throughout the area in search of pasture and water. Stop in the small settlement of Nata for lunch or snack before continuing to Gweta where you have the opportunity of exploring the Salt Pans in an optional 4x4 safari. Alternatively try the (also optional) Baobab Forest tour. After an early breakfast, join a guided walk through a local Tswana village to learn something of the life of the community, from schools and doctors to trading and traditions. 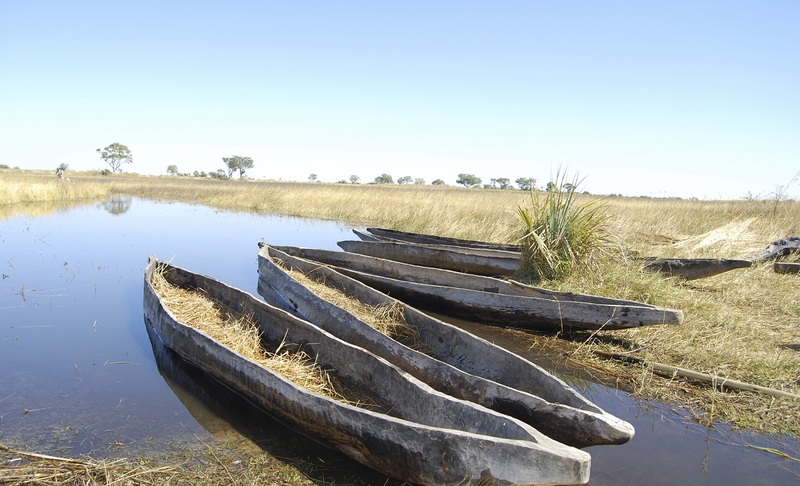 Then, depart and head west to Maun, the gateway to the Okavango Delta. Maun has experienced rapid growth in recent years and is a bustling provincial centre. Options here include scenic flights but our first priority is to prepare for our excursion into the Okavango Delta. The afternoon is at leisure to relax with a cool beverage and pack for the Delta excursion for the following day. Heading out early after breakfast, begin your excursion into the Okavango Delta. The first part of the journey is by 4x4 over rough sandy paths to the ‘mokoro’ station, where the river level reaches. Here you are introduced to the local Tswana ‘polers’, your guides for the excursion and transfer your luggage and equipment to the mokoros (dug-outcanoes). Travel by these shallow canoes amongst giant lily pads, tall grasses and labyrinthine channels to your camp on the edge of the Okavango. The Okavango River rises in Angola (far to the north) and flows south dividing repeatedly to form an intricate floodplain of channels and swamps which then spreads out into a broad flat inland delta – the only one of its kind in the world. Enjoy the afternoon wilderness experience and for many people the feeling of being at camp overnight is an unforgettable experience. This morning, explore the surrounds on a nature walk where you have the thrilling experience of being out in the natural wilderness. This is a great way to enjoy the sights, sounds and smells of the wilderness and enjoy nature as it wakes for the day. After the bush, enjoy breakfast and then pack up again onto your mokoros, leaving nothing behind but footprints. Returning to your 4x4 and bidding your polers farewell, return to Maun. The afternoon offers the opportunity to join the guide for a trip into town for a little shopping. Another popular activity here is an optional scenic flight over the ‘Delta’ for a bird’s eye view of the wilderness you have just explored by mokoro and on foot. 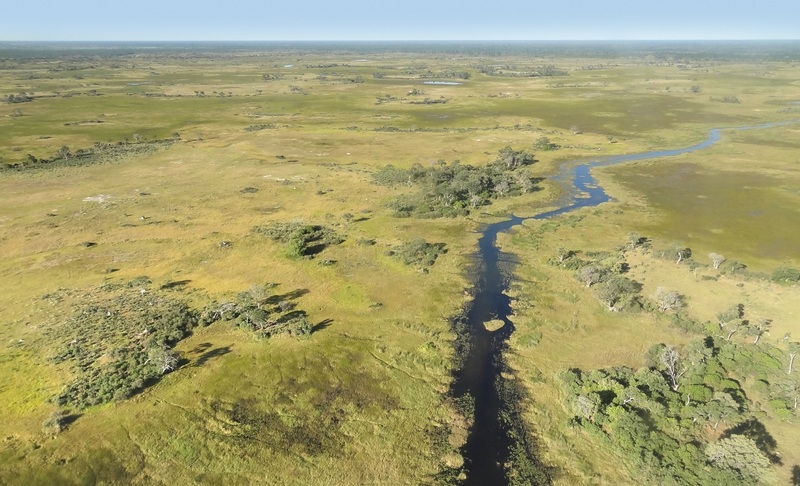 Prices depend on number of people interested but seeing the vastness of the Okavango from the air gives a further appreciation of the beauty of this part of Africa. 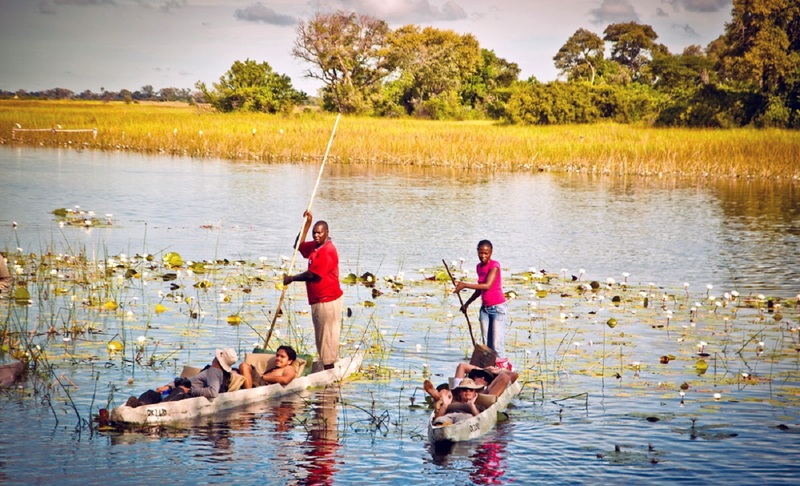 Optional Activities: Okavango Delta scenic flight. Another early rise for your long journey skirting the greater Kalahari, where you may glimpse in the distance the vast salt pans of central Botswana to the Khama Rhino Sanctuary which is normally reached by late afternoon. 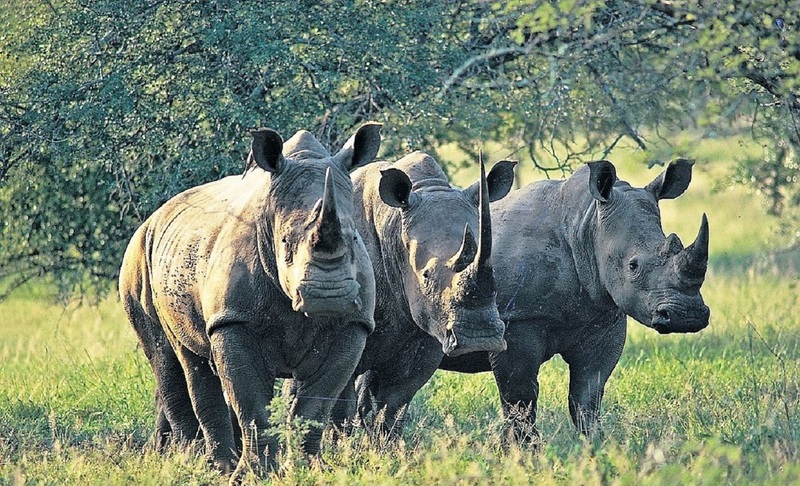 In 1989, a group of local people wished to convert the Serowe Pan, previously a hunting area, into a conservation region for the rhino that inhabited the area. The ‘Pan’ was chosen because of its rhino-friendly habitat (and for its proximity to the Botswana Defence Force base for 24 hour protection against poachers). Khama is a prime habitat for white rhino, zebra, wildebeest and giraffe and with its community based wildlife project, allows the local people to benefit from tourism. Take a game drive to catch sight of some of the rhino with guides often pointing up interesting facts about the local fauna and flora. Our last night on safari is spent at the Stevensford private nature conservancy situated on the Limpopo River in Botswana’s Tuli Block. At 3500 ha, this reserve is home to many species of antelope, crocodile, hippo, zebra, giraffe and a plethora of bird species. Our last morning sees us joining the main route along Martin’s Drift border post. Crossing the mighty Limpopo River into South Africa, we take in the scenic views and notice changes to vegetation, infrastructure and populated areas. We arrive in Pretoria where our tour ends normally by mid to late afternoon. $2228 AUD Last Minute Deal! The Safari Pass covers selected Park entrance fees, activities and excursions and some accommodation along the way. The US$ payment can be made in cash on Day 1 of the tour or a pre-payment of AU$1990 can be made at time of booking. *Mandatory Safari Pass - US$1640 (2019), or AU$2260 when pre-paid. This tour departs Pretoria on Day 1; we strongly recommend that you plan to arrive the day before departure to overcome any jet-lag and acclimatise to Africa. The group size requires minimum of 2 people and maximum of 12 people. This tour has a minimum age limit of 8 years and over.